Guardian Pharmacy of Maine recently attended and sponsored the Maine Health Care Association’s (MHCA) Fall Conference & Expo for the 10th straight year. 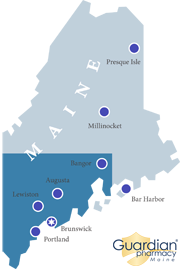 Guardian Pharmacy of Maine brought a new name and outlook to the annual Maine Health Care Associations (MHCA) fall conference. A view of our new tradeshow booth. Courtney Oland, Amy Enos, Kimberly Bowden, along with Tracey Taylor and Michelle Andrews were at the MHCA Fall Conference held at the Samoset Resort in Rockport, Maine October 3rd-5th. Fitting in with this year’s theme of “Change Your Mindset,” Cortney Oland publicly announced our recent re-branding to “Guardian Pharmacy of Maine” to the attendees. The staff at MHCA do an extraordinary job organizing this special event which helps fund several community events. Over the years we have enjoyed learning new things, seeing familiar faces, meeting new people and sharing a lot of laughs and this year was no exception. Another look at our new tradeshow booth! Even though the educational topics were insightful, enlightening and inspiring, the highlight was Ed Latham, Director of Nursing for the Barron Center announcing raffle ticket and PAC auction winners! Thank you to everyone who stopped by our booth to say hello and to learn more about our long-term care pharmacy services. It was great speaking with all of you. We look forward to seeing you all again next year!